Pablo Bolivar, a Spanish producer behind several minimal house releases, and Aphro Sainz have teamed up as Pulshar. 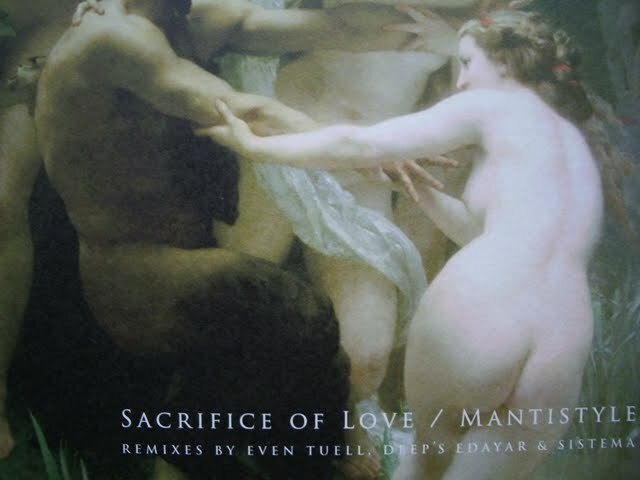 The original “Sacrifice of Love” is a soft-couch-song with subtle dub techno lines, and “Mantistyle” (Deep’s Edayar Remix) is not much different, reminding of the output of Sub Static and other German labels years ago. If not to say it’s a cheap copy of Tikiman. On the flip Even Tuell has turned and twisted “Sacrifice of Love” into a more bassy and minimal track with a recurring vocal sample. Sistema’s remix of “Mantistyle” is a honest and a bit dramatic song that does not pretend creating any crossovers and rounds up somewhat stronger B-side. The beautiful record sleeve uses William Adolphe Bougureau’s painting “Nymphs and Satyr” (1873).